Able2's mission is to enhance the quality of life of those we serve. 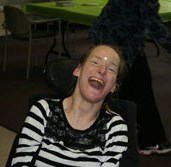 Able2 believes that persons with disabilities are powerful contributors to community, and that all true support is rooted in person-centered practice. We believe the power of potential is realized through partnerships between those we serve, those we employ and the community in which we reside. We believe such partnerships should be formed with a commitment to ethical, responsive, and high-quality supports for individuals with disabilities. In 1949, a group of parents with children having Cerebral Palsy came together in pursuit of educational resources and a future within the local community for their children. That group of advocates became Cerebral Palsy and Handicapped Children’s Association of Chemung County. Through encouragement, action and time, development of opportunities within the community emerged. While the services offered have changed and our organization is now named Able2, our core values remain the same— to serve and protect people with developmental disabilities by creating opportunities for them to live their best life and be contributors to the community. Today, we serve over 1800 individuals through residential opportunities, day and community habilitation services, respite, clinical services, environmental modifications, and self-determined supports.